CCC trainers are specialized, conscientious and dynamic. They have extensive experience in the field and are superbly qualified. They arrive well prepared and grounded in the material. Marjory, a U.S. immigrant from Canada, is an international leader in community interpreting. She has lived in eight countries and studied seven languages. Language and culture are the tapestry of her life. In 2001 she founded Cross-Cultural Communications (CCC). The author of numerous publications, training curricula and trainer guides, Marjory speaks and keynotes widely at conferences across the U.S. and abroad. She has sat on national and international committees and was the world Project Leader for an ISO International Standard on interpreting. Marjory’s special passion is refugee and victim services interpreting, which lie at the intersection of medical, mental health and legal interpreting. Katharine Allen comes from the community and healthcare interpreting fields, including extensive work in international environmental interpreting and translating. 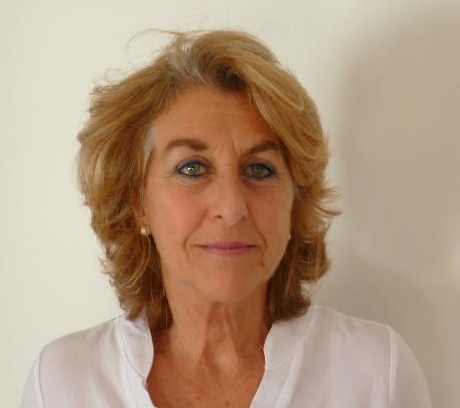 She has worked as a freelance English/Spanish interpreter, translator, trainer and consultant since 1991, specializing in healthcare, education, disability, general legal, the environment and international policy issues. The owner of Chatterbox, LLC, her translation and interpretation clients include a broad range of county and state social service and healthcare agencies, local courts and lawyers, environmental groups in the U.S. and South America, and language service agencies. She works with a translation partner in Chile under Team Translations and is also an instructor for the Glendon College Masters of Conference Interpreting program at York University. Katharine provides language access consulting services to hospitals and clinics in California. She is co-author of the California Healthcare Interpreting Association (CHIA) Organizational Assessment Tool for Linguistic Access, which is used to help hospitals improve their language access programs. She is also a certified trainer for the Connecting Worlds 40-hour Healthcare Interpreter Training and the CHIA Standards Trainings for interpreters and administrators. She has produced and presented multiple workshops on interpreting and translating in community, healthcare and social service settings. Katharine has also taught medical interpreting Train the Trainer short-course workshops for the Monterey Institute of International Studies. Katharine holds a Bachelor's Degree in Community Development from Brown University and a Master's Degree in Translation and Interpretation (MATI) from the Monterey Institute of International Studies. She served on the Board of the California Healthcare Interpreting Association (CHIA) from 2002 through 2009, including a two-year term as President. She also served as Administrative Assistant for the Interpreters' Division of the American Translators Association (ATA) from 2005 to 2007 and belongs to several other professional translation and interpretation organizations. Katharine has published articles in professional publications and regularly presents on translation, interpretation and language access issues at professional conferences. Maisoon is originally from Darfur, Sudan. Fluent in Arabic, Darfurian and English, she received her degree from Khartoum in medical laboratory science and is currently a master’s degree student at the School of Conflict Analysis and Resolution at George Mason University. Maisoon has worked in several nongovernmental organizations (NGOs) in Sudan supporting refugees with a focus on HIV/AIDS, maternal and child health and monitoring human rights violations. Her background includes work at the Union-United Nations Mission (UNAMID) in Darfur, where she worked closely with conflict-affected populations and Internally Displaced Persons (IDPs), and at the United Nations Population Fund (UNFPA). In the United States, Maisoon has served as an evaluation officer at the Elizabeth Glazer Pediatric AIDS Foundation and as a Community Health Promoter and Arabic and Darfurian community interpreter for the International Rescue Committee (IRC) in Baltimore, Maryland, where she helped refugees gain access to social services and medical care. Maisoon joined CCC in 2015 and graduated from The Community Interpreter® in 2016. A resident of Westchester County, New York, Otisha Ayala-Faya has been a professional freelance interpreter for over 20 years. She is nationally certified as an American Sign Language (ASL) interpreter by the Registry of Interpreters for the Deaf (NIC-RID) and a qualified Spanish interpreter. As a registered interpreter for the New York State Unified Court System for close to 10 years, she is often asked to cover special cases that require trilingual interpretation. Throughout her career, Otisha has worked intensively as a systems advocate and language access consultant. A former hospital administrator for interpreting services, and an ADA & LEP compliance officer at one of the largest medical centers in New York City, she also served as an advisory board member on medical interpretation and best practices with the Greater New York Hospital Association (GNYHA). Otisha has over 15 years’ experience teaching ASL and English as a Second Language (ESL). She has a special love and passion for teaching and for the Deaf and Latino communities that she serves. Otisha has also been a medical interpreter trainer for over 10 years. In her role as a mentor to new interpreters and college students, she works on relating theories of professional practice to real life situations. She continuously thrives in understanding how best to serve the interpreting community around her, and shares her passion and her experiences in the classroom, providing a safe and beneficial learning environment for all of her aspiring interpreting students. A Maryland Court Certified Interpreter in Spanish since 2012, Leslie Bilchick has been an interpreter for more than 20 yeas and a translator for over a decade. She provides court, educational and social services interpreting and translation, in addition to being a long-time community interpreter trainer and licensed trainer for The Community Interpreter® International. Pamela Bohrer-Brown is a bilingual/bicultural American who lived for 17 years in Venezuela, where she and her husband adopted two Venezuelan children. A program manager and past coordinator for the HHS Bilingual/Bicultural Demonstration Project for Baltimore Medical System (a federally qualified health center with seven clinical sites), Pam also coordinated the Hispanic Health Care Access Project in Baltimore. She is currently Director of Maternal and Child Health and Multicultural Programs at Baltimore Medical System. In addition to her fourteen-year involvement with the Baltimore Latino community, she has offered trainings, conferences presentations and workshops in interpreting, community health and Spanish secondary education. Pam is also a trained Childbirth Educator and Doula (birth companion) and health educator. Pam has extensive experience interpreting in all sectors of health care, from hospitals to small clinics, and she has interpreted for human and social services as well. Her central focus is women's health programs serving Limited English Proficient Mexicans and Central Americans. From Uruguay, Sylvana Fernandez-Ellauri was a physician for 14 years in her home country before moving to the United States in 2002. She received her medical diploma and postgraduate degree in pediatric medicine from the Universidad de la Republica (UDELAR). Sylvana changed careers upon her arrival to the U.S. and has now accumulated 12 years of experience as a professional medical interpreter and interpreter trainer. Her areas of training expertise include: medical terminology, anatomy and physiology. A Certified Medical Interpreter (NCBMI), since 2014 Sylvana has been a full-time staff medical interpreter at the University of Virginia Medical Center in Charlottesville, where she also offers refresher courses to healthcare interpreters, and classes on specialized medical terminology and concepts for interpreters in various specialty settings. She is a graduate of The Community Interpreter® International – Training of Trainers. Carola, originally from Guatemala, is a federally certified court interpreter (FCCI) by the Administrative Office of the U.S. Courts. She served as key staff for the Federal Court Interpreter Certification Examination (FCICE) and the Consortium for Language Access in the Courts (CLAC) programs at the National Center for State Courts and was involved in all aspects of test development, test administration, and test rating activities. She has over 20 years of experience in professional interpreting as well as teaching and training interpreters, having received her Professional Certificate in Legal Interpretation and Translation at the University of California, San Diego. Carola has served on multiple boards and committees related to the interpreting profession and is a founding member of the California Healthcare Interpreting Association (CHIA) and the National Council on Interpreting in Health Care (NCHIC). She has presented at more than 75 international, national, and local interpreter educational conferences. Carola has co-authored several publications about interpreting in the legal and medical fields including seminal publications like CHIA's California Standards for Healthcare Interpreters, NCIHC's A National Code of Ethics for Interpreters in Health Care, and most recently, interpreter training curricula like The Voice of Love's Healing Voices, Interpreting for Survivors of Torture, War Trauma and Sexual Violence, and AYUDA's Breaking Silence, Interpreting for Victim Services, featuring a workbook, glossary and training manual. Omari Jeremiah has worked as a freelance Spanish interpreter and translator for over five years. He received his BA in Sociology from Goucher College and his MA in Counseling from the University of Baltimore. Omari is a passionate advocate for language access in educational systems. He has worked as a resource provider for ESOL students and their families in Baltimore City Public Schools and currently works as a resource provider for a school in Baltimore County. A native of New York City, Omari has traveled extensively to various countries including Spain, Guatemala, Costa Rica, Panama, Nicaragua and Chile. He is fluent in Spanish and is currently learning Swahili, Portuguese and American Sign Language. Omari also does freelance work as an online ESL teacher. Besides his love for languages, Omari is the author of the children’s book series Paperboy. Kelly Macías is a writer, trainer and organizational development consultant specializing in cultural competence and diversity, equity and inclusion. She has 19 years experience working with educational, non-profit, government and international organizations to support their efforts in education/training and organizational change—specifically focused on supporting and improving access for racial and ethnic minorities. Kelly has taught cultural competence training to university students and professors, social service agency employees, community workers and congregations, labor union employees and members, elected officials and employees at local, state and federal government agencies. She recently worked full-time at the Service Employees International Union where she was responsible for managing equity and inclusion programs for local unions serving more than 2 million members in the mainland United States, Puerto Rico and Canada. Kelly earned her Ph.D. from Nova Southeastern University in Conflict Analysis and Resolution with a focus on ethnic and cultural conflict and has worked with organizations in Colombia, Ecuador, Ghana, Guatemala, Jordan, Lebanon, Mexico, Nicaragua, the Philippines, Thailand, Turkey, Uganda, the United Arab Emirates and Vietnam. She works professionally in English and Spanish. When Kelly is not training or working with organizations, she writes for a variety of publications on the topics of race, gender, conflict and cultural competence in health care. Her work has been published in Culture and Health: Concept and Practice, The Baltimore Sun, Cultural Studies-Critical Methodologies, Daily Kos, The Feminist Wire, Twenties Unscripted, Rain and Thunder: A Radical Feminist Journal of Discussion and Activism, Teaching Peace Through Popular Culture, and The Qualitative Report. A native of New York, Daniel Sanchez is an East Coast Regional Client Services Manager with InDemand Interpreting. Daniel’s career in the language services industry spans more than a decade serving Non-English speaking and Limited English proficient individuals from diverse cultural and socioeconomic backgrounds. He has worked as a medical, educational, social services, legal and conference interpreter and as a voice-over artist for several healthcare organizations seeking to expand their medical education outreach to Spanish-speaking communities. Daniel has been an interpreter trainer for more than five years and is a subject matter expert on language access laws. He is a medical certified interpreter through the National Board of Certification for Medical Interpreters. Daniel’s background encompasses an array of specialties including program development and implementation; training multicultural and multilingual staff; and conducting in-service education and training on language access and cultural competence. His expertise in language access laws has enabled him to play a key role in ensuring organizations meet and exceed compliance with regulatory and accreditation requirements. Daniel has served as a Language Services Coordinator for Lancaster General Penn Medicine and as Chair of the Diversity and Inclusion committee for the Educational Commission for Foreign Medical Graduates. He strives to professionalize the language services industry to mitigate healthcare disparities, improve patient safety and increase health equity. A professional interpreter and translator since 2006, Dr. Jeanette Zaragoza De León is a certified medical and healthcare interpreter (NBCMI and CCHI), New York Certified Court Interpreter and New Jersey Approved Court Interpreter. She has also worked as a conference interpreter and translator in legal and faith-based settings. Jeanette has trained interpreters and translators since 2009 at several institutions including Hunter College and New York University. Jeanette has delivered academic presentations in six countries and is currently a Visiting Research Scholar at Yale University. She has a BA in Child Studies from Lesley College, an MA in Divinity from the Pacific School of Religion, an MA in Translation from the University of Puerto Rico, an MA in Translation and Interpretation Research and a PhD in Applied Languages, Literature and Translation, both from the Universitat Jaume I.